How to get your Private Pilot Certificate. My name is Taylor Anderson and I am the full-time flight instructor here at Colgan Air Services. We are very excited to have a fresh face to our website, and would like to continue adding new content to better suit our visitors! I will be answering questions pertaining to flight instruction, general aviation, pilot certificates, regulations, and whatever else you want to ask me about as new topics arise! 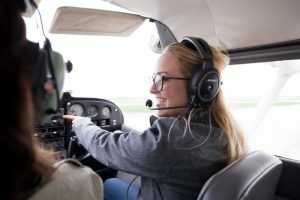 The journey to a Private Pilot Certificate (PPC) is mostly the same across the country, only varying slightly if you obtain the certificate through a 2 or 4 year university – a topic we can cover on a later date. The Federal Aviation Administration (FAA) requires that you pass a 60 question written knowledge exam, as well as an oral and practical exam with a Designated Pilot Examiner (DPE). The oral and practical portion can be done right here at Colgan Air Services with our very own Tim Colgan, the owner! At our FBO, a big first step for the PPC is to attend Ground School. I typically host ground school 3-5 times a year depending on how much interest I have for the course. Class sizes are small and we often take “field trips” to the hangar to learn more hands on and speak with other aviation professionals. After our first few days of class are complete, I will start scheduling flight training with each student. Scheduling is very simple using our online scheduling system to see available time slots and aircraft. The FAA requires a minimum of 40 hours of flight time to be eligible for a PPC, so flying regularly will help you finish the PPC with far less hours (and money!) than an irregular flight schedule. Typically, I recommend most students fly twice a week if they’re able! There are three basic steps in going through our training curriculum beginning with preparing the student for their first solo flight! Solo flight is exactly what it sounds like, you get to take the airplane up without your instructor aboard! It’s a huge first step in attaining your PPC, and is a very exciting moment for both the student and instructor! After you’ve soloed the airplane, we move into cross-country flying. This is the portion of flying where you actually get to go to airports across the state and learn how to navigate, calculate fuel consumption, and acquire important aeronautical decision making skills. For your PPC, you’re required to complete 10 hours of solo flight time, 5 of which need to be solo cross-country! Once we’ve completed all of the required training for cross-country flight time, night flying, solo time, and all other requirements; we move into check ride preparation. This is the time during which we hone your piloting skills to prepare you for your oral and practical exam! After completing the check ride preparation, you’re off to see Tim for a check ride! Depending on the student, this training time can range from a couple of months to a couple of years! I hope this piece has helped you to understand a little bit more about obtaining your PPC. If you’d like more details, send me an email! Any questions that I receive I can try and answer through additional blog posts – or have that information added to our website. We always appreciate your suggestions and ideas! Are you looking for something unique to give your friends and family? Join Us for a Safety Seminar with the FAA Safety Team and AOPA!